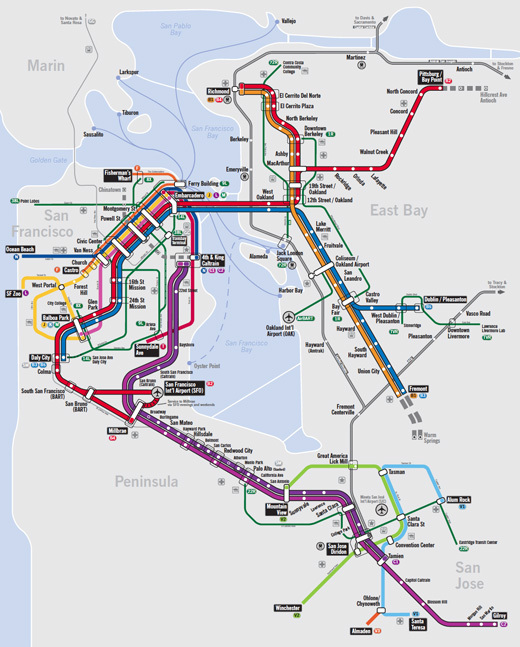 One mapmaker's vision for a single integrated Bay Area transit map. Plus, what a comprehensive regional transit system might look like. Maps are highly contested territory, nearly impossible to create without arousing suspicion, ire or alternate viewpoints. As such the job of the cartographer is one not just of art but of diplomacy. Here, mapmaker Brian Stokle has endeavored to create two visions of the Bay Area’s transit systems exclusively for The Urbanist. 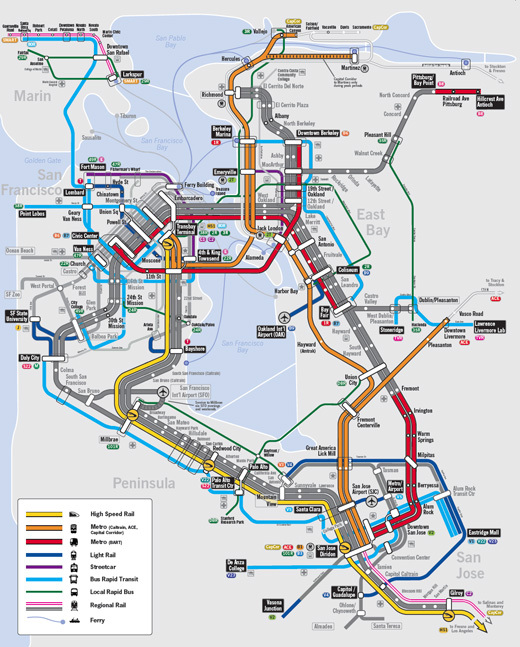 Below is a map representing all of the transit routes in the Bay Area to illustrate the potential for connectivity between existing systems (as well as those under construction). It aims to demonstrate how far a single map could go toward improving not only legibility of our many systems but actual transit mobility. Following the first map, Stokle presents a somewhat utopian vision of what Bay Area transit could look like in the future. Both maps have been designed to promote conversation — and even provoke debate — around the future sustainability of transit in our region. As Stokle explains, most transit maps do little to show the routes of nearby systems, which makes system legibility, not to mention transit mobility, quite limited. The Muni system map is helpful for navigating San Francisco, for example, but there is no comparable regional map to help one navigate easily between say, San Jose and Oakland. 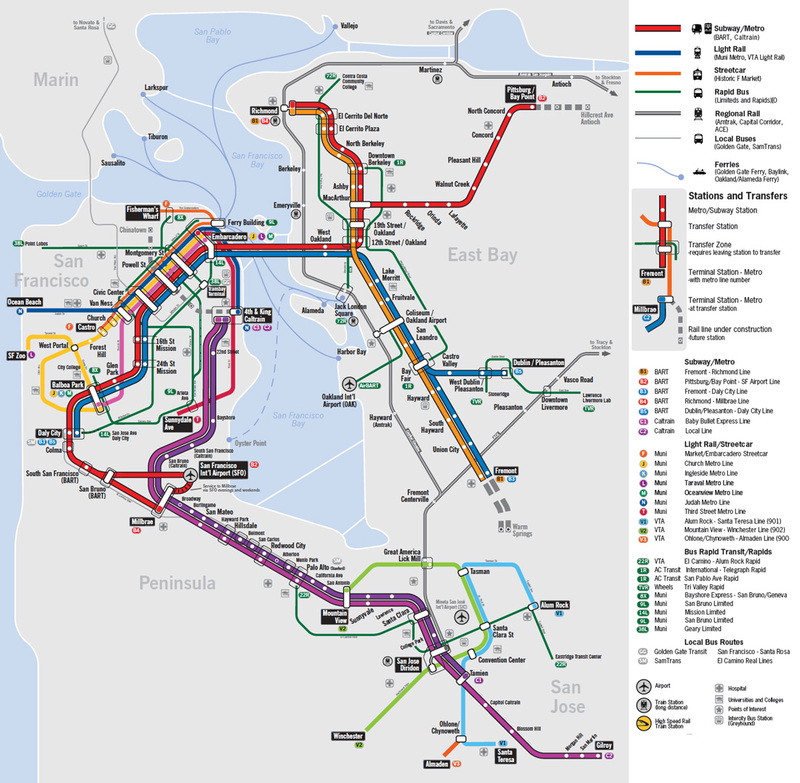 This integrated map of the Bay Area’s rail and rapid bus system aims to show how a legible map might positively affect transit mobility in the region. 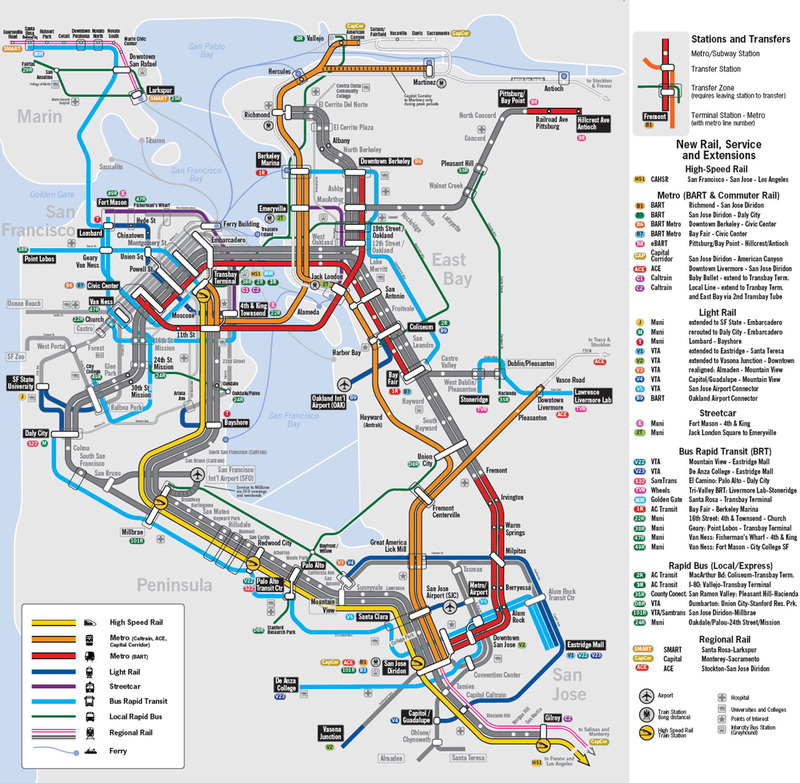 This map reveals some of the geographic and other logistical challenges to making an integrated regional transit map given that the Bay Area is vast and there is a 60-mile long body of water in the middle of it. Although only 47 square miles, San Francisco has much more transit than the Peninsula or the East Bay. Consequently, it has been made disproportionately large in order to keep the map legible, while other areas are condensed in size. This map endeavors to maintain some sense of geography for reference, and shows all the rail and rapid bus routes. Planning ahead for future transportation infrastructure is always important, even during economically challenging times, because building and implementing new projects require years of planning, gathering funds and garnering political and community support and review. This map highlights future projects — some planned, some theoretical — that would improve transit service in the Bay Area. Also included are new service, extensions and reroutings where significant access improvements would benefit localities and the region as a whole; a second Transbay Tube; numerous bus rapid-transit extensions throughout the region ; and express bus service along the Peninsula to service employment areas east of Highway 101. Some planned or proposed transit projects are not shown — such as BART to Livermore, Dumbarton Rail, and the continued BART extension from San Jose’s Diridon to Santa Clara. While SPUR previously endorsed the first two extensions in its 2008 report "A Midlife Crisis for Regional Rail," they are excluded here both due to questions about those projects' costs/benefits and to spark continued debate about which transit investments would have the greatest positive benefit to riders. When looking at service rather than modes (e.g., rail, bus), we find that many areas would be better served by high quality bus rapid transit instead of new rail service. While rail service is desirable, it is often not cost-effective and lacks demand in particular corridors or to certain stations. Brian Stokle is an urbanist who specializes in cartography and transportation planning. You can see more of Brian's map work on his blog Urban Life Signs at urbanlifesigns.blogspot.com.